I enjoy eating solo. While I understand that sharing a meal is a pleasurable social experience, I also know that some of my most memorable meals have come when I’ve dined by myself. With company, I am easily distracted, my focus is pulled away from the food and I find it’s harder to concentrate on the dishes being presented to me. When I dine solo, I can eat and drink without guilt or thought of anything other than what is going into my mouth. I find that not only are tastes accentuated in solitary dining, but I take more pleasure in the texture of food. I also enjoy the added bonus of getting to “hear the room”. It’s rare in our busy lives to be able to sit quietly with ourselves, and even harder to be comfortable with that. Even though I love to eat by myself, I do have a moment of anxiety of doing so just before I walk into a restaurant. But then I always think of my mom. I remember when I was younger, my mom used to wait for my dad to pick her up from work at a hotel restaurant. She would sit by herself and order a shrimp cocktail or a bowl of soup and sometimes a glass of white wine. I remember going with her a few times and we’d sit quietly together. I learned that if you were polite and didn’t stay long, it was ok to order something small. She also instilled in me that it didn’t matter who you are, everyone deserves to enjoy the finer things in life. The most important lesson was that I should always recognize and appreciate nice things when they happened to me. Me and my mom around 20 years ago. She ordered a shrimp cocktail and wine and I had a clam chowder. A small simple meal shared quietly in a wonderful setting. As I walk towards a restaurant for a solo meal, I think of my mom and envision her sitting quietly, with content and the lessons I learned from her. These thoughts remind me that eating by myself can be pleasurable and that I should enjoy the moment. I booked myself in to a few solo meals in LA. My first, a lunch at Spago and then a sushi dinner because I wanted to remind myself of the pleasures of eating quietly. Both meals have great meaning to me for different reasons. 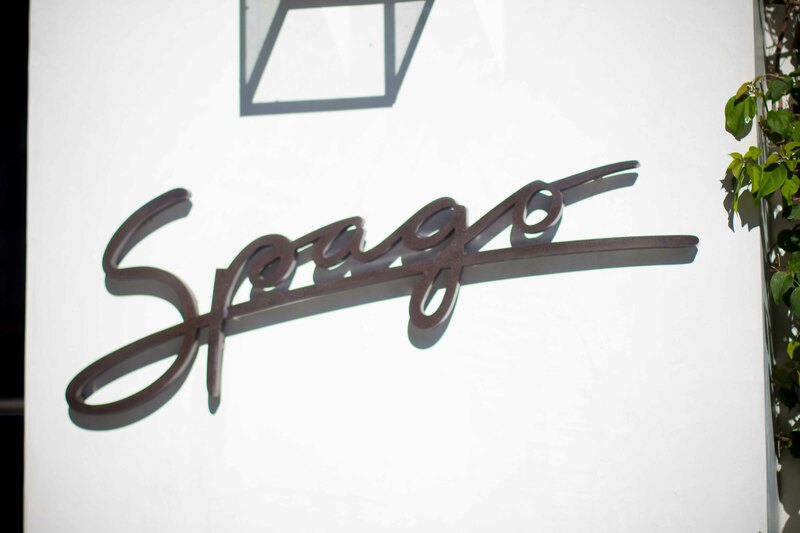 The latter is another post, but lunch at Spago had special significance when I think about my eating adventures and what my mom has taught me. My food memory is incredible and I have many etched deeply in my mind. One that stands out is when my mother and I were in Las Vegas almost 20 years ago. My dad was sitting at a table in a casino somewhere and I was there to keep my mom company. For dinner, we decided to splurge and I chose Spago in Caesar’s Palace. It was my first forray into “celebrity dining” and I remembered every moment of it. I remember the delicious bread, the bright and acidic salad, the decadent pasta and how much fun my mom and I had enjoying every taste and giggling over the absurdity of all that was Vegas. 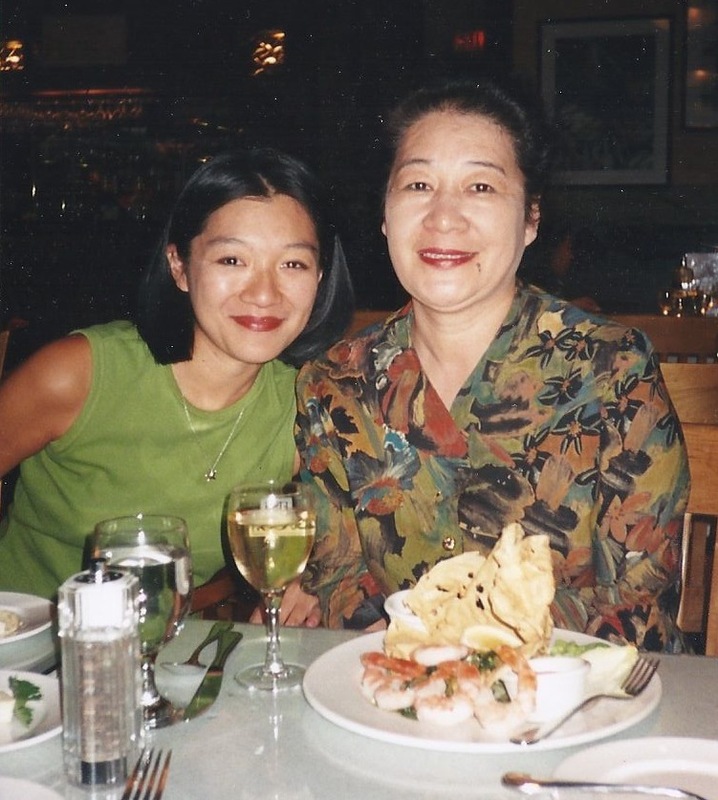 It was a meal that opened the door to fine dining for me, but was also one that my mom helped to show me that I never had to compromise having a good time because of the setting. Because Spago was one of my benchmark food experiences, I have been curious about Wolfgang Puck’s Spago in Beverly Hills since I started regularly visiting LA, more than 12 years ago. But Spago has never been “hip enough” for group dinners nor exciting enough to me to go on my own. Dining in LA has always meant searching for new and delicious. LA is on the cutting edge of the food scene in the west, and I’m excited every year to experience new flavours. I’ve also felt skeptical about the Wolfgang Puck empire, feeling that it’s too big for anything to be special. But this year, I was interested in experiencing meals that brought me back to my roots of eating well, and Spago seemed a perfect choice. When people travel and dine alone, most chose quick and easy or find a pub where you can pull up to the bar. While I’m all for eating solo at the bar of nicer restaurants, I’ll only do so if I don’t have to compromise on quality or ambiance. So when I walked in to Spago in Beverly Hills through the bar, I thought that it would be easier on my psyche to have my meal there, but when I saw the bright and spacious dining room, I knew I had to keep walking through to get the full Spago experience. Dining alone, I’m often led to the banquette to sit and while I succumbed in Mexico to sit on the bench, I didn’t do so at Spago. I decided instead, to look into the kitchen at the action with my back to the dining room. There are the little choices you have to be cogniscent about when you dine by yourself. The service at Spago was amazing, and between my server and every other man in a suit working in the restaurant, I had someone at my table every few minutes to ask me how I was doing and engage me in conversation. And to top it all off, the food was delicious. 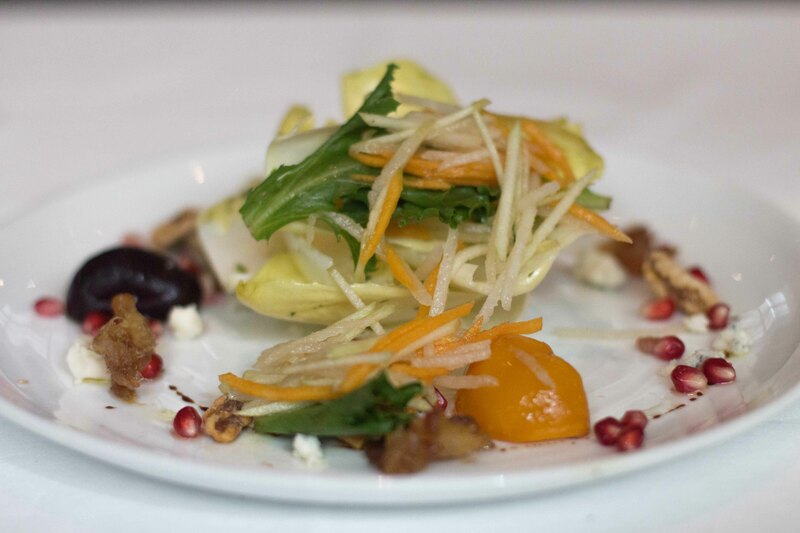 Belgian endive salad with goat cheese, beets, pomegranate and apple. 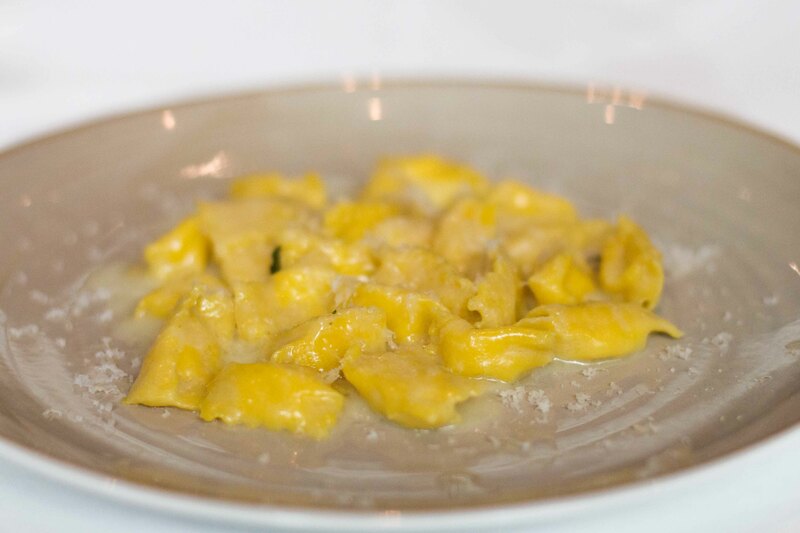 Handmade celery root agnolotti with marscapone, parmesan and brown butter sauce. I’m happy with my experience at Spago. I felt like I chose my meal perfectly. The bright crisp and clean salad followed perfectly by the pasta stuffed uniquely with savoury sweet celery root. The pasta was light but decadent and the same time, and I couldn’t help but break out into a huge grin at first bite that followed through until I scraped the dish clean. It was a meal that I know my mom would have loved.